Recently, I made a change to my Twitter following policy. I now follow anyone who follows me. The reason I didn’t do that before was because I had a ton of followers and if I follow every one of them, I felt my Twitter stream would be overwhelmed with hundreds of new updates every few minutes. Fortunately, thanks to a Twitter client call TweetDeck, I don’t have that problem. 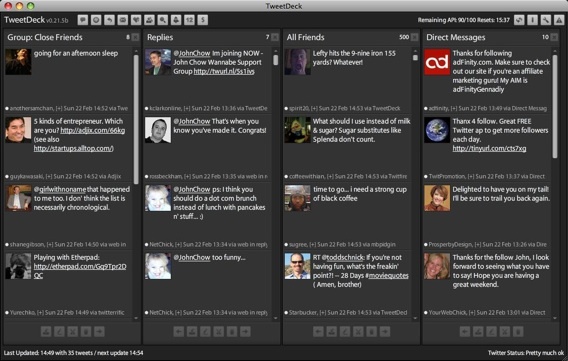 TweetDeck was made aware to me by Tris Hussey during a Third Tuesday live blogging session. TweetDeck’s big advantage over other Twitter clients is its ability to divide your stream into groups. Instead of having new tweets, replies and direct message all mangled together, TweeDeck shows each stream in their own group window. You can also create other groups to break down and better manage your Twitter followers. This has what allowed me to follow over 8,000 people and still maintain my sanity. I created a group call “Close Friend” and put only people that I want to truly follow in there. These are the people who’s tweets I do not want to miss. I also have a business group and another group that monitors Twitter for my name or certain hash tags. With this setup, I don’t have to worry about missing important tweets, replies or direct messages. According to Twitstat, TweetDeck is the number one Twitter client after the web browser. TweetDeck users make more tweets per user than any other clients. Considering how much better organized TweetDeck allows you to be, I’m not surprised by its higher use. Now, if only TweetDeck would create an iPhone version of their app.